Peleg is now an Assistant Professor of Computer Science at the University of Colorado—Boulder. "Individual bees can tell the direction of the strain based on their connection to their neighbors," said Jacob Peters, who recently defended his Ph.D. in OEB, and co-first author of the paper. 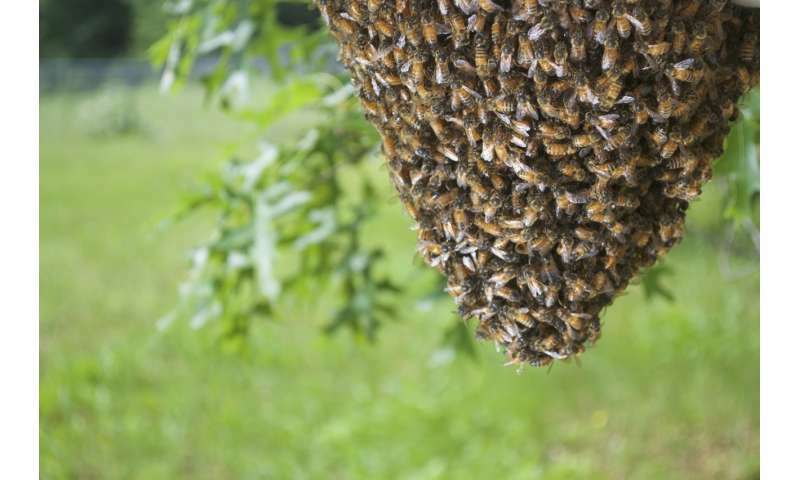 "Because the strains on the swarm are highest at the top of the swarm, where its connected to the branch—or in this case, the board—they know to move up. All the bees move up together because they're influenced by this gradient, so it leads to a coordinated movement." When the cluster flattens during horizontal shaking, load sharing by individual bees increases but the colony overall is more stable—similar to crouching when the ground is shaking. The researchers were able to mimic this behavior in a computer simulation by imposing rules at the local level.